View of Chalfant Street from Estella Street, looking west. Streets--Pennsylvania--Pittsburgh. ; Pedestrians--Pennsylvania--Pittsburgh. 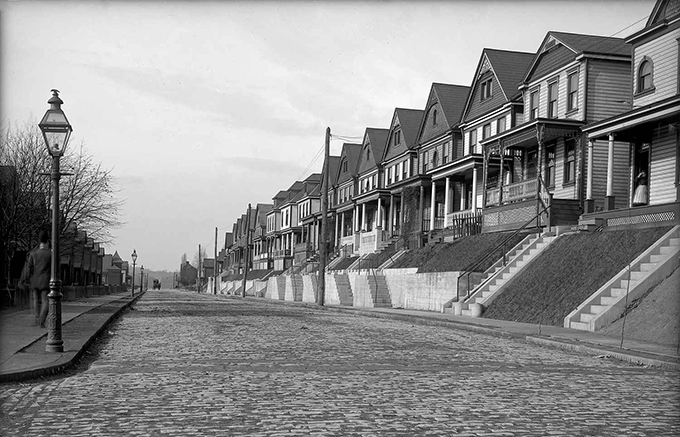 ; Dwellings--Pennsylvania--Pittsburgh. ; Horse-drawn vehicles--Pennsylvania--Pittsburgh. ; Chalfant Street (Pittsburgh, Pa.). ; Beltzhoover (Pittsburgh, Pa.). 300 block of Chalfont St.